I'll take the huge indestructible spirit with a side order of wrath, please. Let's take, as our starting point, a couple of tribes within tribes. Firstly, what do the following five have in common? Spirits with obscenely high casting costs, a requirement to be played from the hand, with indestructibility and a cool ability if we do so. That's the obvious starting point. Let's take a step back from that, and think about how we could possibly get even one of these critters into play before being overrun by an even vaguely optimised generic tribe. The answer lies in the other thing which these behemoths have in common: They all cost three mana of one color to cast on top of their colorless cost. 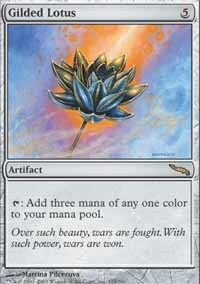 Three mana of any one color: Where have we ever seen that before? Take a look at the type line on that last one: Convenient, isn't it? 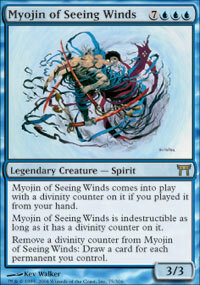 Even so, the three of any one color is just a start, and we need 5 mana beyond that to get even the cheapest Myojin in play. Still, if we can drop a Gilded Lotus or Verdant Eidolon in the first instance, we should be all set, the trick then lies in doing that before we get swarmed. 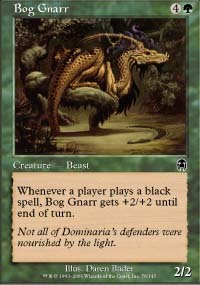 In addition, take a look at the creatures we have: Aside from the Wrath, the Wit's End, the uber-Elvish Piper and the 'Draw a large chunk of your deck', we have an Armageddon: Non-land mana sources are to be preferred, so that if we're in a position to blow up the world, we can make at least an attempt at recovery. As to the lands, we have two potential angles: try to cover all the bases or rely on our twelve sources of Lotusy goodness to pull us through. I lean towards the second option, and aim instead towards reliably being able to wrath or to drop a few blockers, those being the options most likely to keep us alive. 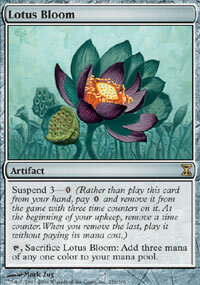 The ideal start with this deck is to suspend a Lotus Bloom and drop a Krosan Verge on turn one, a land and mana rock on turn two, a land and second rock on turn three, popping the Verge for a pair of Temple Gardens, then a Cleansing Fire or Life's Web on turn four. Failing that, any combination of mana rock, lotus, Eidolon and land in your opening grip should be able to see you through to a turn 5 myojin. The deck is weak against high tempo decks: When your gameplan starts at turn 4 at best, if your opponent's game ends there, you're in trouble. Every single tribe member costs a fortune: Luckily, most of them are worth it. 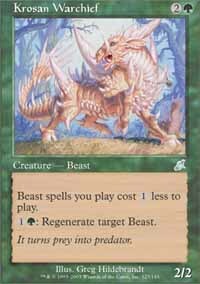 It's hard to win a war of attrition when nothing short of an edict will send an opposing creature creature to the 'yard, and on top of that, removing divinity counters are just as swingy as they need to be. 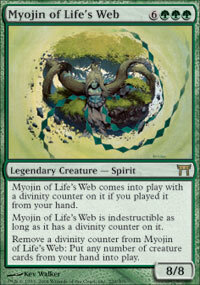 You can wipe out their hand, creatures or land pretty much at will, and don't be afraid to drop a couple of undivine myojin via Life's Web either defensively or offensively. One of the nice little tricks back in Invasion block were the Gnarrs: one triggered every time someone played a blue spell, the other on a black spell, giving themselves +2/+2 in the process. 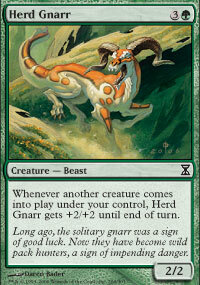 More recently, Herd Gnarr made the duo a trio, triggering on creatures coming into play under your control. Note the mana balance: base black rather than base green, with the idea being to generate harpy mana repeatedly in a turn. The Dimir commons are one of the better means of doing so, and with the utility cards make sure you're not stuck with Tainted lands. Infest is the removal of choice as your Glade and Herd Gnarrs will survive it, and it may well be possible to drop a Cavern Harpy to keep your Packs alive as well. If need be Recoil and Consult the Necrosages can combine into an effective Terminate in certain circumstances, but most of the time you'll just want to draw two. Your principal strategy is to curve out with a couple of Gnarr, using the Warchief as a cost reducer and regenerator if needed, then just use the harpy as a sorcery pump spell with free buyback until your opponent is dead. You want to force your opponent into 'must block' mode as quickly as possible, because you have one set of creatures less than him as the Harpies are spells.That, and the relatively high curve of the Gnarr, are your biggest drawbacks. 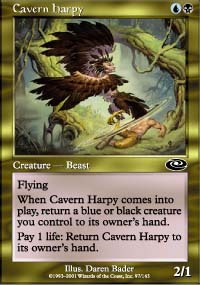 If you find yourself in a position where you need to Recoil one of your own permanents, don't forget you only need one Cavern Harpy in hand to be your engine. If someone tries to kill it whilst it's bouncing in and out of play, take the point of life to keep it around. As an aside, be very careful you don't activate the life payment when bouncing the harpy normally, the MTGO client can be unforgiving. One Avatar Combo Special, to go! Let's finish up with one of the higher-costing tribals out there: Avatar. 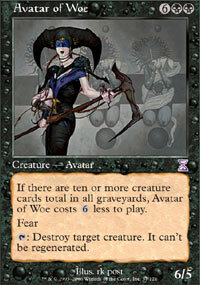 With the exception of Avatar of Discord, the Onslaught Nameless One cycle (Given that we have Dakkon Blackblade and Grinning Ignus in Magic, we just need Annah, Morte, Fall-From-Grace, Vhailor and Nordom for the 'Cast of Planescape: Torment' deck) and Ethereal Champion, we have a curve that starts at 7 and goes up. As with the Myojin deck, we could go for the acceleration route, but let's look at what we can do with our overpriced huge guys. 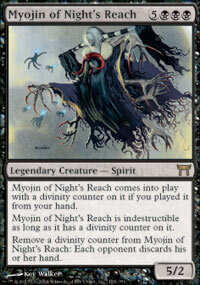 We can get them into the Graveyard fairly easily between Discord and Scion of Darkness. the Scion can pluck creatures out of the opposing graveyard, which Sanguine Praetor can sacrifice to sweep that manacost. If we need extra reach, Stalking Vengeance can make short work of an opponent's lifetotal in conjuction with that sacrifice effect, and Avatar of Woe covers removal, evasion and making Visara the Dreadful look like a copycat. They will do for our set of 20, and line us up nicely for a reanimation theme. 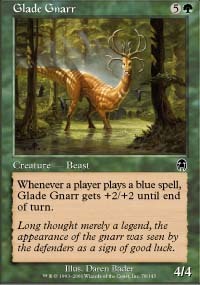 We need a reliable means of getting multiple creatures in play, hopefully one that won't break the mana bank. Living End does the job nicely, especially in conjunction with Fury Charm to speed it up. That charm also acts as a handy Shatter and a great way to annoy chump blockers, and we can get more Avatars into the yard with Vengeful Dreams, which also serves to buy time and prevent our opponent benefitting from the End. Finally, Debtors' Knell works beautifully with Sanguine Praetor and in terms of keeping your guys in play, and enables you to break stalemates by using Avatar of Discord as 5 points to your opponent's head for each Stalking Vengeance in play. As you'd imagine, your biggest problem is likely to be the early game. 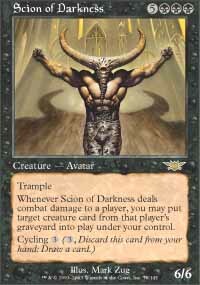 A turn 3 Avatar of Discord or suspended Living End is a solid opener, followed up by Fury Charm or Vengeful Dreams accordingly, depending on how close your enemy is to swarming you. Those two instants are key: It is likely your opponent will try and race the slow-burning wrath effect of the End, and they provide the best way to ensure he fails. Avatar of Discord is a removal magnet, but does useful duty as either speedbump or evasive threat as you set up your reanimation. If you survive the first six turns, you have a solid chance of winning. So there you have our selection for this time around. Synergy doesn't have to be spelled out on the card: take a look at each member of your chosen tribe and see how other tribe members can interact to win you the game, without merely fulfilling the criterion of being an 'X'. Until next time, may you be surprised at the unexpected possibilities of your deck. I'm glad you're paying attention. 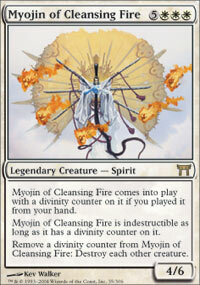 You are correct in that there are 16 Myojin listed, 4 short of a Spirit tribal. You'll also note that, under the 'Divine Foliage' heading, there are 4 Verdant Eidolons, bringing us up to the 20 spirits we need. 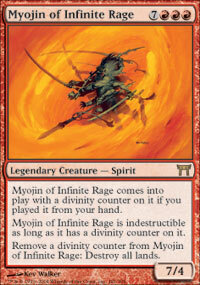 Now correct me if I'm wrong, but do I assume that their is a typo in the Myojin deck? If this is tribal shouldn't there be a req. of 4 a piece to meet standards? Wow, $140 manabase for a "casual" deck. Thank goodness for PDC. Fair comment, but just because a card costs money doesn't mean you can't have fun with it if the opportunity arises. Given that, basics, snow basics and relentless rats aside, you only need 4 of a given card online, there is no reason to hold back on what you have if you have it. There will be times when I build all-common decks, others where I go for the full blinged out invasion rare-heavy decks. I appreciate more than most that money is an issue: Practically all the funds I channel into my card collection come from either this column or player-run events, frequently taking the proceeds from one article to fund the next. I have a large collection because it has been growing online for almost half a decade, and I have the ravnica duals because they're very, very useful. All of these decks are fully adaptable: feel free to substitute cheaper equivalents (Or more expensive) as you see fit. This is a pretty sweet series. 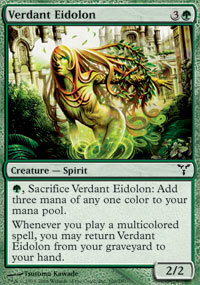 You manage to take a format that a lot of people find constricting, but find ways to make clever, original decks. Its cool to see articles that bring up different ways of looking at the format. The more tribal, the better. Are these decks viable at all or are these just gatherer regurgitations? Fair question, Gnawph. All of these decks I have successfully piloted to multiple wins in the Casual room, with the one exception that I used Excruciator as a sub for Avatar of Woe, as I didn't own any at the time. I don't feel comfortable posting a deck I haven't built, tested, and above all had fun with.